Click play above for some ambient street sound while you read. Headphones are best. Go ahead. Or just grab the MP3 (15MB). Some of my latest experiments with cheap macro photography uptown got me relooking at an area with which I thought I was very familiar. It turned out there was a lot to discover when looking on different scales and with different tools. Thursday night I extended that exploration through sound. I took my portable TASCAM DP-008 8-track digital audio recorder (above, centre) and wandered around King Street and Waterloo Park recording… everything. Really cool to tread outside the visual domain and start thinking about concept, composition, and execution in the audio domain. Happily, I learned some stuff trying this out. Initially, I was using a Shure SM57 external mic, but that just wasn’t working for this type of gig. It’s a great microphone if you’re singing talking right into it, or it’s stuck right inside the piano, but for capturing ambient noise it was way more directional than I anticipated. I guess that’s the whole point of the cardioid sensitivity pattern. More of a problem was the low signal level I was getting even with the gain cranked. Maybe a pre-amp is the ticket. Or maybe just a whole different mic. Something that was obvious with both the SM57 mic and the built-in stereo mics on the DP-008 was that recording in wind can make for a very unusable recording. I actually aborted the mission after 15 minutes, headed home, cut up some foam and fit a hunk over the 57 and also buried the recorder itself in a block of foam (which you see in the pic above). Then back uptown to restart. This packing foam that Dave picked up from the trash somewhere worked pretty well and cut most of the wind noise. A couple challenges on this gig were being totally silent myself so as not to screw up the recording and being patient to discover sound. I can’t tell you how many times I brushed a mic or yanked the headphone cable causing some really loud local sound. How hard is it to “remove” that seamlessly in post-processing with Adobe Soundbooth? Very. And as for discovery, when shooting photos you can look down the street, see something cool, walk over and shoot it. With audio discovery, I tried to get myself in places I thought might have interesting sounds, record, and then just wait, checking my levels, waiting and more waiting. 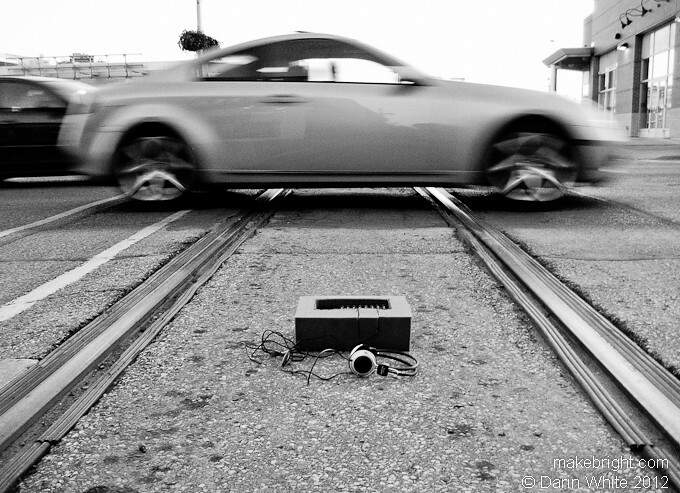 This entry was posted in sound and tagged King Street, soundscape, TASCAM DP-008, train tracks, waterloo. Bookmark the permalink. Love the idea of being silent and taking in the sounds… unique and enjoyable! Keep up the good work, Darin! !